First of all, I hope your family is enjoying and celebrating a blessed Father’s Day today! If your dad is now enjoying his day in Heaven, like mine, then I hope you are taking time to remember him and celebrate his memory. Today’s card is a little tribute to today’s celebration, to fathers in general, since I thought this was a great male card with bright, Summer colors and stamps. 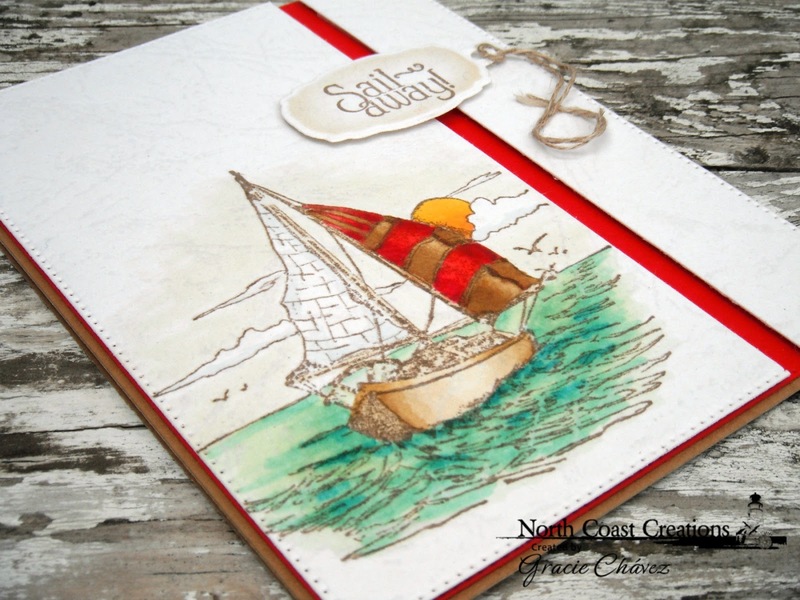 I was inspired by a wonderful new stamp set by North Coast Creations, Our Daily Bread Designs sister company, an thought I would use bright colors to create a clean and simple card. 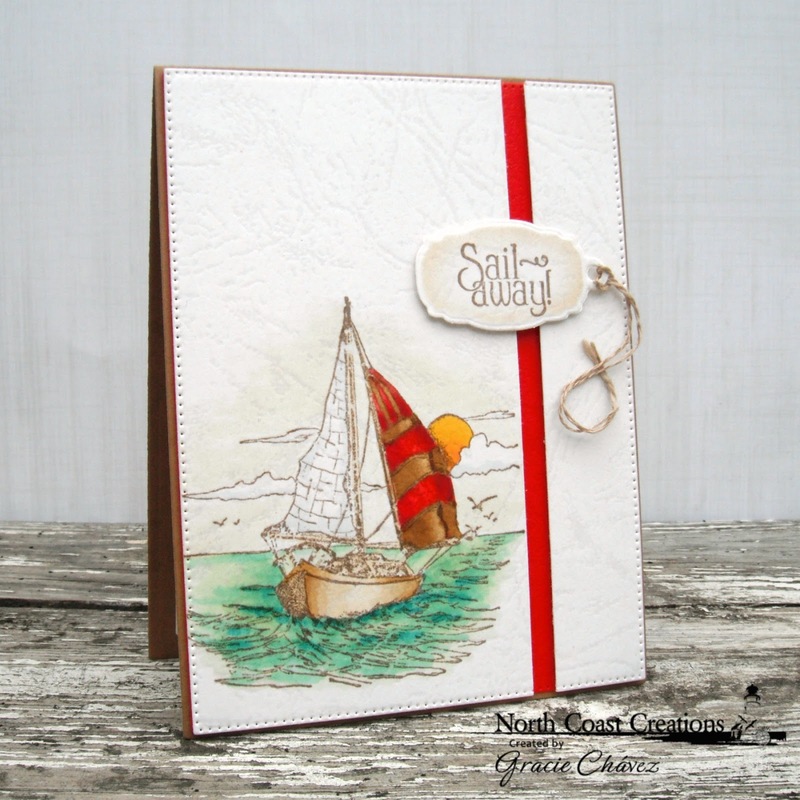 This new stamp set is called Sail Away. I colored the image with alcohol markers, using various tones of aquamarine blue for the sea and light browns and red for the striped sail. The contrast is lovely and very suitable for Summer. I like this sentiment too and what I did is die cut it with a Mini Tag die (that I find so versatile) and add some linen thread. I also cut the front panel vertically to leave a gap and reveal the red layer beneath it. I hope you enjoyed today’s post. For more inspiration by NCC’s designers, please click here. Thanks for visiting and see you again soon! Gracie, this is gorgeous. Your coloring is splendid. I love your stitching. What I find very striking is the gap you created, letting a strip of red show through. Brilliant! Lovely card. Would love to get this stamp. It is so useful for male cards and I love the scenes of the sea. Your coloring brings out the beautiful scene. What a beautiful card, Gracie, and I love the layout and beautiful coloring! It's stunning! My DH is a real sailor, having grown up with sailboats as a child and onward. I love this stamp. My precious dad is also with Jesus now, and I always miss him more dearly on Father's Day. May God comfort you with the joy of knowing we shall see them again! Hugs, sweet friend! This is a stunning card. Love the colors and simplicity.